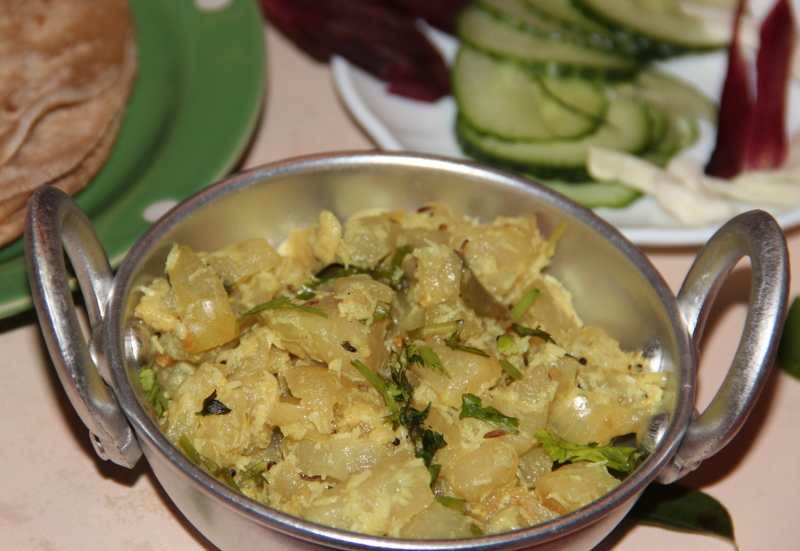 Chayote/ chow chow is a simple, healthy curry where steamed chow chow is sauted in onion and spices. Chow chow/chayote squash is actually a fruit that is used as a vegetable. Pronounced “chi-OH-tay,” it is small and pale green, resembling a large pear. In fact, it is also called vegetable pear. Related to the cucumber and zucchini, chayote has a mild, somewhat sweet flavour. Steamed vegetables are a nutritious and quick choice for any dinner table. There are several methods to choose from, and you don’t need a steamer or any fancy equipment. Chayote squash has no cholesterol or fat. 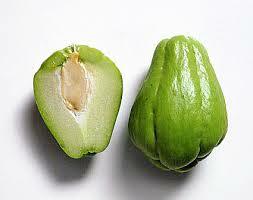 Chayote is also extremely low in sodium, having only 3 mg in one-half cup. Chayote squash adds a bit of fiber to your diet. Purdue University says an herbal tea made with chayote squash leaves is used for lowering high blood pressure, dissolving kidney stones and treating atherosclerosis, or hardening of the arteries. On stove top without steamer: you need a large pot and a steamer basket/ colander that will fit in. Fill the pot with enough water so that is just reaches the bottom of the colander or steamer basket. Once the water comes to boil add the chopped chow chow on colander/steamer and place it on the pot as in double boiler with the lid covered on top as such that the steam has to escape similar in pressure cooker. Steam for 13-15mins / Until the vegetable is firm but tender. Once done remove the steamer. Colander and set aside until required. Heat oil in the pan, add mustard seeds as it crackles add cumin seeds, curry leaves, asafoetida, slit chillies, onion and cook on a medium high flame for 4-5 minutes stirring in between. Then add steamed chow chow/chayote and simmer for 4-5minutes/until heated through. You can even cook chow chow in microwave as well, Just add chopped chow chow with onion and stir fry in the pan and cook until tender and soft. Posted on December 25, 2014, in Indian, Side dish. Bookmark the permalink. 10 Comments. I’ve seen those in the store but never knew what they were. A very nice healthful stew. Looks delicious. Yes Suzanne…They blend well in curry too.. I am so intrigued! I have seen those around but never knew what they were or how they are supposed to be used. Will have to try! Please give it a try HD..